The Stoughton Opera House is located in the heart of Stoughton, Wisconsin, just a few minutes southeast of Madison. The theater plays host to a wide variety of musical and theatrical performances throughout each season - from bluegrass to rock, folk to classical, comedy, and the occasional oddity, the Opera House has it all! Know for its sublime acoustics and early 20th-century aesthetic, the Stoughton Opera House is a local jewel. The cast of the 1910 Junior Class Play, The Deacon's Second Wife. Originally called the City Auditorium, the theater first opened in 1901. For over 50 years, it hosted a variety of performances and meetings, from operas, musical productions, minstrel and vaudeville shows, and class plays, to temperance meetings, speeches by Governor "Fighting Bob" LaFollette, graduation ceremonies, and more. The Opera House fell into disrepair in the mid 1950s, and after extensive damage from roof leaks and neglect, the Opera House was shut down, and the clock tower removed in 1961. In the early 1980s, a decision was made to save the building and government offices. The Friends of the Opera House was established and local citizens came forward to support the restoration through donations and volunteering. 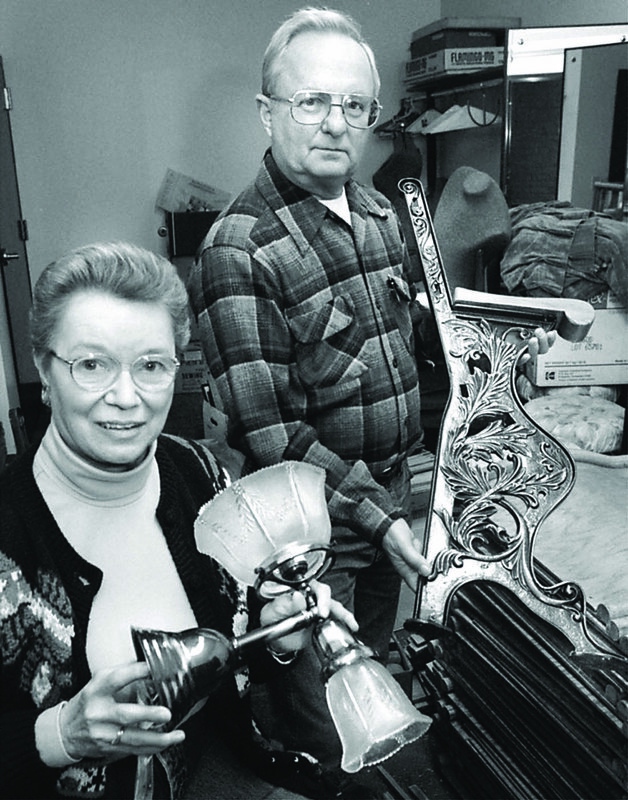 Restoration coordinator John Vorndran and his wife Judy with the restored chandelier and refinished seats of the Stoughton Opera House. The first major project was to restore the clock tower, which was completed in 1988. A matching grant from the Jeffries Family Foundation funded much of the restoration work. The City of Stoughton contributed to the restoration of the building's main entrance, and the addition of an elevator and restrooms in the basement. Overall, restoration work included plaster, carpet, floor lights, dressing rooms, paint, and increased accessibility for those with disabilities. State of the art sound and lighting equipment combine with the historic building features to make the Stoughton Opera House a "crown jewel" of southern Wisconsin. The beautiful space boasts Victorian and modern elements that combine for an unmatched performing arts experience. To learn more about the historic City Hall building, view a calendar of upcoming performances, or buy tickets to a show, visit the Stoughton Opera House website.